Occupation: A professional Textile Artist and a Painter. Society of Nigerian Artists, ASA of USA and Canada, ACASA, Society of Nigerian Women Artists, Member of Osun Support Grove, Board member of the National Heritage Council of Nigeria, Member of the Board of Trustee of Osun State Centre For Black Culture and International understanding, etc. Nike is the Managing Director/CEO of Nike Center for Art and Culture, Osogbo where trainings are offered free of charge to all Nigerians in various forms of arts. The center was established in 1983, by Nike solely from her earnings as an artist and without governmental assistance. Nike opened this center with 20 young girls who were marching the streets in Osogbo aimlessly and who had no hopes for the future. In their tender age, Nike withdrew these girls from the streets and provided them with free food, free materials and free accommodation at her residence at Osogbo and taught them how to use their hands to earn decent livings through the art. So far, over 3000 young Nigerians have been trained in the center and who are now earning their decent livings through art. Many African countries now send their students to study textile art at the center. The Nike Center for Art and Culture, Osogbo now admits undergraduate students from many universities in Nigeria for their industrial training programs in textile design. Over the years, this center also now admits students from all over Europe, Canada and the United States of America. International scholars and other researchers in traditional African art and culture also visit the center from time to time for their research works into Yoruba "Adire" fabric processing and African traditional dyeing methods. Nike is also the Owner/Curator of the Nike Art Galleries at Lagos, Osogbo, Ogidi-Ijumu and Abuja. In 1996, Nike established a textile (Aso-Oke) weaving center at Ogidi-Ijumu near Kabba in Kogi State for the women of the village, employing and empowering more than 200 women in the weaving center. In June 2002, Nike established an Art and Culture research center at Piwoyi village, FCT Abuja with an art gallery and a textile museum, the first of its kind in Nigeria which will provide functional platform for research into Nigerian traditional textile industry in the Federal Capital Territory area of Abuja. In furtherance of these noble endeavors, Nike is currently the managing director and founder of the following organizations in Nigeria; "Nike Art Productions Limited" which she incorporated in 1994, "Nike Art Gallery Limited" which she incorporated in 2007 and the "Nike Research Centre for Art and Culture Limited" which she incorporated in 2007. Also in 2007, Nike founded the "Nike Art and Culture Foundation" with some notable eminent Nigerians as trustees, with the main aims and objectives of fostering Nigerian cultural heritage. In 2003, a certificate of merit was awarded to Nike by the Okun Yoruba people of Kogi State of Nigeria in recognition of her efforts in youth development in Nigeria. In 2002, Nike was bestowed with an award of distinction by the National Association of Kogi State Students in recognition of her efforts in promoting Art awareness among the youths in Nigeria. In 2002, Nike was awarded and admitted as a fellow of the institute of The Pan – African Circle of Artists of Nigeria in recognition of her commitment to the promotion of art education in Nigeria. In 2009, The “CEPAN Foundation” of Nigeria awarded Nike a plaque of honor for being the African Art Icon of the year. In 2010, the National Drug Law Enforcement Agency (NDLEA) of Nigeria presented Nike with a golden plaque of honor in recognition of her noble role in the fight towards drugs free Nigeria society. In 2010, the Osun State Council for Art & Culture presented Nike with a golden plaque of excellence for being one of the leading "Patron of Art & Culture" in the State. In 2011, the "Northern States Chambers of Commerce, Industry, Mines and Agriculture" presented Nike with a crystal plaque of honor for her leadership and entrepreneurship roles in Nigerian commerce and industry. In 2011, the Art Galleries Association of Nigeria (AGAN) in collaboration with the Nigerian National Gallery of Art (NGA) presented Nike with a plaque and a certificate of honor for art dealer of the year. In 2011, the SISI-OGE Foundation of Nigeria awarded Nike a crystal plaque for her outstanding dedication in the promotion of Nigerian cultural heritage. 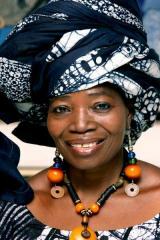 In 2012, The Business and Professional Women of Nigeria Association honoured Nike for her Outstanding and Leadership quality in area of her entrepreneurial spirit and her role as a change agent in promoting art and culture globally and for the empowerment of rural community women and young people. In November 2012, Nike was presented a plaque of honour ward by the Female Artists Association of Nigeria (FAAN) for her support and contribution to the growth and development of Female Artists in Nigeria. In December 2012, Nike was presented a plaque of honour ward by the National Council for Art & Culture (NCAC) in Abuja in recognition of her efforts in the promotion of Nigerian Creative Industry and Empowerment through Visual Art. In May 2013, Nike was presented with a golden trophy by the National Museum, Onikan, Lagos in appreciation of her contributions to the development of the National Museum in Lagos. In June 2013, Nike was presented with a golden plaque, titled "Life Achievement Award" by the Ogidi Development Union in Kogi State in recognition of her efforts in the development of Ogidi village in Kogi State of Nigeria, her birth place. In March 2014, Nike was invited by the First Lady of Kogi State under the auspices of "Kogi State Women Association of Nigeria" and she was awarded "Women Inspirational Award - 2014" in recognition of her efforts in motivating and economically empowering the rural women of Kogi State. Nike was principally educated in art by her great grandmother whom Nike lived with after the death of her mother and grandmother. Her great grandmother was a weaver and an "Adire" textile maker/dyer during her lifetime. It is therefore, interesting to observe that Nike had no serious formal western education because of lack of fund. Her parents were quite poor and they could not fund her education. The truth is that, Nike lost her mother at the age of 6 and her grandmother at the age of 7. Her father, late Nicolas Ojo Allah who was a village traditional drummer and baskets weaver in his days could not help her much to acquire higher western education. Nike stopped schooling at primary 6 school level at her village at Ogidi-Ijumu in Kogi State of Nigeria. However, Nike went ahead to teach herself English at home. She never went to school to study art which had brought her to global spotlight. Vocational training in art was passed down to her by her great grandmother, late madam Ibikunle who was an "Adire" textile maker and a dyer of fabric during her days in the village of Ogidi-Ijumu, Nike's birth place. Watching her great grandmother in the art of "Adire" textile processing and helping her out in "Adire" making, Nike walked up the line to become an expert in "Adire" textile making, dyeing, weaving, painting and embroidery. This was the way vocational training was passed down from parents to children in Yoruba communities in those days in Nigeria. Nike steadily built upon what her great grandmother taught her and went ahead to develop her own style and technique in textile design and painting, and how to effectively present them for exhibitions. Nike is a multi talented person who was able to use her natural given ability to assist and help many less privileged. In that quest, she has been able to give hopes to the hopeless in our society. In the same vein, Nike has been able to economically and socially empower many rural women by setting up cottage weaving workshops/centers for women at Abuja, Osogbo and Ogidi-Ijumu thereby giving voices to them in their various communities. Nike's challenges were many especially when her activities are centered at men dominated societies. The men saw her initiatives and activities to be too out in giving the so called liberties to women who were hitherto oppressed in the rural areas. In her humble quest to further promote, enhance, sustain and provide enabling environment for the growth of African cultural heritage in Nigeria, Nike single handedly went ahead in 2009 and built a five floor ultra modern cultural art centre at Lekki Peninsula, Lagos with the main purpose of positively transforming the landscape of the hitherto neglected art and culture in Nigeria. This building was opened to public in September 2009. This building also holds Nike's second textile museum. It also houses the 4th Nike Art Gallery in Nigeria with a large stock of Nigerian and African art of deferent media. In her keynote speech during the opening ceremony, Nike did tell the world, "I dedicate this building to the glory of God and to the Nigerian cultural heritage". Since the opening of this building, the "Nike Cultural Art Centre" has become a cultural hub and a popular tourists' destination in Lagos Nigeria. From a very modest beginning without serious formal western education, Nike's actions and initiatives have positively impacted the lives of so many who came her ways. Other than giving the benefits of her exposure to the less privileged, Nike's works have meant and become close to a large array of dedicated fan across the globe where she has become an ambassador of good will for art and culture for her beloved country since 1974 when she first took her art works across the shores of this country to the Americas for exhibition. Her interactions cult across divide; politicians and non politicians, diplomats, scholars, business men and women, researchers, children, tourists, etc come on daily bases visiting Nike and her centers in Nigeria. 1. In 1974, Nike was one of the ten African artists who toured and taught arts in various crafts institutions in the USA. These tours were sponsored by USIS, Lagos. These trips took Nike to the fifty (50) states of America including the ice region of Alaska and the Virgin Islands of America conducting workshops and delivering lectures in schools and community centers. 2. In 1981, Nike’s work won the first prize during the SOUTH WEST ARTS FESTIVAL in Washington DC. USA. And she was awarded many prizes of honor at the end of the festival. 3. In 1983, The Nigeria Arts Council, Lagos sponsored Nike to represent Nigeria at a workshop held at the Museum of Natural History, New York, USA. During which period, her works attracted many arts collectors. 4. In 1985, Nike was one of the six women artists who exhibited at the African Heritage Kenya during the World Women Conference held in Nairobi. The UN sponsored her trip to that conference. 6. 1989, Nike and Sokari Douglas Camp were the only Nigerian women artists who represented Nigeria in an exhibition held at the women museum in Washington DC. USA. 7. In 1991, USIA sponsored Nike’s educational visits to many institutions of higher learning and museums in USA. This trip again took Nike to; Washington DC to deliver lectures and conduct workshops at the Howard University, the University of Maryland and the Rhode Island School of Textile. 8. In 1991, Nike and Sokari Douglas Camp co-featured as the only Nigerian women artists in a film “KINDRED SPIRITS” produced by Smith Sonia on Nigerian artists which was a television documentary in USA and Canada. 9. In 1991, during a conference of Black Artists held in Toronto Canada to celebrate African identity, Nike was sponsored by the CUSO of Canada to that conference as the only Nigerian artist who exhibited her art works and held workshops at that conference. 10. In 1992, Nike was the only African who represented the continent of Africa in an exhibition organized by BMW Company, Munich Germany during their anniversary celebration. Nike was accompanied by her cultural troupe to the show. 11. In 1994, during the celebration marking the 50th anniversary of the UN, Nike was one of the 50 world artists selected to exhibit their works in a film; a documentary in-put for the anniversary that was exhibited in South African. 12. In November 1994, Nike exhibited her art works at the Royal York Hotel, Toronto Canada during the 37th annual conference of the African Studies Association of USA and Canada. 13. In 1995, Nike was one of the ten (10) African artists who had exhibition at the African Heritage in Nairobi, Kenya. 14. In 1996, Nike held an exhibition at the University Of Tampa Florida, USA. The exhibition was followed by series of lectures and workshops she conducted at the department of fine art of the University. 15. In 1997, Nike held an exhibition at the prestigious ‘Schobgarten Galleria’ in SCHOBGARTEN, Germany. 16. In 1998, Nike held an exhibition at the University of Wisconsin, USA. This exhibition was followed by series of lectures she delivered at the department of African studies of the University. 17. Also in 1998, Nike went with her cultural troupe to Antwerp, Belgium to perform at the Wereld Cultural Center in Antwerp. 18. In 1999, Nike held an exhibition at Northern Michigan University, USA. The exhibition was followed by series of lectures and workshops she conducted at the department of humanity of the University. 19. In 2000, Nike was invited by the Federal Government of Nigeria to supply all the textile materials, which she designed for the Nigerian pavilion at the Expo 2000 in Hanover, German. Her art works were also on display during that Expo 2000 in Hanover, Germany. 20. In June 2000, Nike was invited to Italy by the CISV of Italy and Caritas of Italy to organize art exhibitions and art workshops in Turin to address the problem of female prostitution in that country. She mounted these art exhibitions and art workshops, which was largely attended. 21. In October 2000, Nike was invited with her cultural troupe by the Nigerian Ambassador to Netherlands to perform at the Hurge in celebration of the Nigerian 40th independence anniversary. 22. In 2001, Nike went with her cultural group to Antwerp, Belgium to perform at the Wereld Cultural Center in Antwerp. 23. In 2001, Nike held an exhibition at the Pan African Film Festival (PAFF) in Hollywood, Los Angeles, California. USA. 24. In 2002, Nike was again invited to Hollywood for an art exhibition during Pan African Film and Art Festival (PAFF). 25. IN 2002, Nike was in Denison University, Granville Ohio. USA for an art workshop and lecture. 26. In 2002, Nike was in Bowling Green State University, Toledo Ohio, USA to hold art workshops and lectures. 27. In June 2002 Nike was invited as a special guest artist in resident during the commonwealth festival of art in Manchester, UK. 28. In July 2002, Nike had exhibitions of her works in Ausgburg, Germany during the La Piassa art festival. 29. In August 2002, Nike was in Calgary, Canada for exhibitions during the “Afrikadey” annual festival. 30. In November 2002, Nike was at the Dartmouth University, Hanover, New Hampshire, USA as artist in resident, holding exhibitions, art workshops and lectures at the department of humanity of the University. 31. In December 2002, Nike attends the annual meeting of the African Studies Association of USA and Canada which holds in Washington DC. As a long time member of this association, her art works were also on view during the conference. 32. In February 2003, Nike was a special guest artist in resident at the Pan African Film and Art Festival in Los Angeles USA where she awarded certificate of honor by the County of Los Angeles, California, USA. 33. In September 2003, Nike was invited by Belgium government with her cultural troupe to perform amongst other cultural troupes from other 40 African countries at Antwerp cultural centre. 34. In February 2004, Nike was artist in resident at the University of California, Berkeley, USA. 35. In July 2004, Nike artist in resident at the International Folk Art Festival at Santa Fe, New Mexico, USA. The festival was sponsored by the Museum of New Mexico Art Foundation. 36. In October 2004, Nike was appointed a member of the UNESCO Committee of the Nigerian Intangible Cultural Heritage Project. 37. In May 2005, Nike was a guest artist in resident at the African Art Festival in Wurzburg, Germany. 38. In June 2005, Nike was in Graz, Austria with her cultural troupe to perform and show case Nigerian art at Maria Moser Centre. 39. In May 2006, Nike was appointed a board member of the Federal Capital Territory of Nigeria Tourism Board at Abuja, Nigeria. 40. In January 2007, the government of United States of America selected Nike and sponsored her trip to Cape Town, South Africa to participate as a facilitator/panelist at the world conference of "Vital Voices Pan-African Leadership Summit & Initiative for Women and Girls". At that conference, Nike presented a paper "Art, Activism and Women Empowerment" in Nigeria which caught the hearts of her audience at the conference. This paper was posted at her web site for six months from January to July 2007. 41. In March 2007, Nike was invited by the University of South Florida, Tampa to conduct workshops and lectures at the department of women studies and art history, on batik and traditional African textile (Adire). 42. In April 2007, Nike was invited by Harvard University, Cambridge to conduct workshops and lectures on batik and technique of adire textile processing and African dyeing techniques. 43. In 2008, Nike was invited by University of Alberta, Edmonton Canada to conduct workshops and lectures on African batik and the technique of Adire textile processing and African dyeing methods. 44. In August 2009, Nike was once again invited by the promoters of “Afrikadey” annual festival of Calgary, Canada to exhibit her works and conduct workshops on Adire processing during the six days festival. Please, read a biography of Nike authored by Ms. Kim Marie Vaz, “THE WOMAN WITH THE ARTISTIC BRUSH” widely recommended for university students studying African arts and cultures in the USA. More information can also be obtained from Nike’s web site: www.nikeart.com to drive home her expertise in art and African culture.